Quite unnerving to think that content could be lost through a host closing down . . .I have copies of images but not what I write. 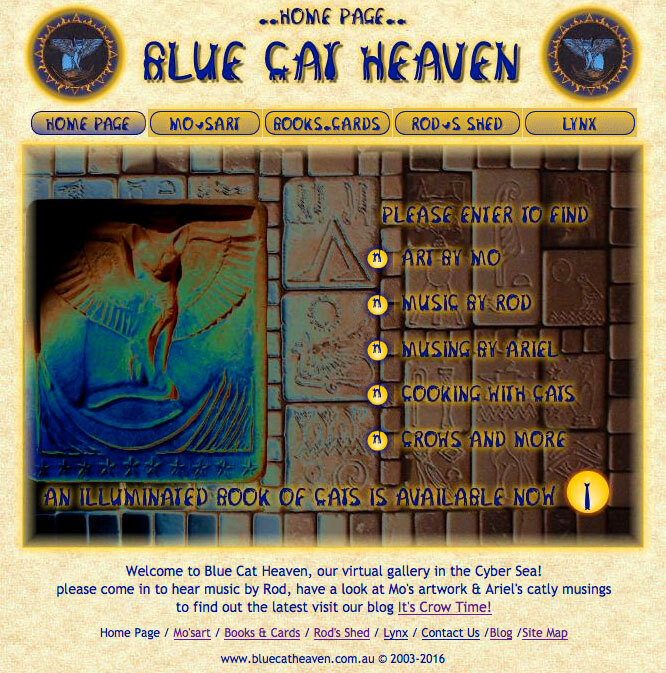 In 2003 I built Blue Cat Heaven as a portal for our first book Cooking with Cats which grew into An illuminated Book of Cats and further on into a sprawling labyrinth of magic, music and crows branching off into Rod’s Shed in the process but they have become neglected over the years in this fast moving world of blogs & social media. So when our host decided to pull the plug on Monday we considered finding a new host and moving the websites but decided they are history, it’s like leaving home and flying free! I am aware I was there at the Birth of the site. It feels sad suddenly this end. but it’s exciting too! this year is all about letting the Crow Book fly! Oh yes! I understand that feeling . . . sometimes the destruction of the old is a necessary part of memorialising moving on. it still feels like we’re living in a science fiction movie! I understand the metaphorical cutting of strings, but…. it’s really quite a lovely feeling of lightness knowing I don’t have to fiddle with code again for the forseeable future! land safe ! thanks for the mail! (((Yvette))) it’s a wild year! thanks Carol, for all the good vibes and encouragement since Cooking with Cats ! I understand about moving forward but still, it will be a sad day. thanks for the heads up tho…it gives me a chance to have another look. And I have to remind myself that I do have that special copy of An Illuminated Book of Cats…..very special to my heart….but then again everything I have of both yours & Rods, is. (((Eliene))) this is the impetus I needed to do something new for the Crow Show, we could have moved the websites to a new host but they were getting old and tired, both needed full rebuilds every 3 years to keep them up to date with all the changes in the cyber sea & that was well overdue, really we were only keeping them going because of the convenience of not having to change the e-mail addresses connecting us with everything… it took two days but it’s done Phew! this is really Something. Much LOVE as you Fly Out to you, the old man, the cat…. this sure is some ride, the energy is building by the day! Love love love……see you wherever you are. Hallo Mo. I feel the same as Eliene and Tilly….sad…BlueCatHeaven is closing down, I have spent many a happy hour browsing there and still love your incredible gourds and books as much as your drawings…I am hoping you will fly free then come to land in the branch of another beautiful tree and open a new website. I find its so much easier to browse your web site than the blog pages. Harder to find things on your blog, different formatt, so much packed in so tightly…whereas on your web site a feeling of space and the lightness of being flowing through. Sending immense appreciation for all you have shared…here is to new ways of being. All the best to you and Old Man Crow. And of course…I tip my hat to Ariel P. Cat! the venerable muse of our house! ((Mo)) so glad you are considering another form…a new website. Your blog is great! Awesome! But so packed full, it sometimes feels congested, and I cannot find things I wish to return to….to sit with, to contemplate, to enjoy that spark of joy… It feels more linear, whereas a website seems to have more dimensions, feels more expansive, full of space and light…room to wander, meander, follow a trail or simply take my coat of and sit with my elbows on the table, gazing deeply in awe and wonder at one of your creations. Then allowing me to move with ease to find another trail to an old favorite that feels like an old friend! Ah! The power of creativity, of Art…of sharing! wow what wonderfully encouraging words! So beautifully put Christina. I feel the same but could not have expressed it as you have but thankfully Mo knows my heart sings when she shares All. At the same time I completely understand how much time it all takes to put together.